Now you can hook your friends on WoW for free! Blizzard has had Recruit-a-Friend initiatives in World of Warcraft for years, now, but when it came down to the bottom line, the friend still had to buy his or her own copy of the game after the free trial. Sure, you can probably find it for $15 or $20 at your local GameStop, but it's still a hurdle between a prospective player and an adventure in Azeroth. Consider the hurdle considerably lowered: Blizzard is giving long-time WoW players a free copy of World of Warcraft to give to their friends, including the requisite free month of playtime before the subscription kicks in. 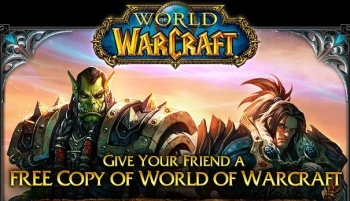 If you've been playing the game for years, now, check your email for instructions and a special code on how you too can get your friends hooked on WoW. There's no word on exactly how long someone has to have been playing to be considered a "veteran." I got my email, and I've been playing since February 2005 - three months after the game came out. Maybe it's a "year one" sort of thing, or maybe there's a bit more leeway there - nobody knows right now except for Blizzard. You'll have to buy the expansions separately, of course, but the revamped Level 1 to Level 60 content is one of the best parts of the game for a prospective newbie, so it all works out in the end. And really, if a new player decides at the end of the free trial month that WoW just isn't their thing, at least they aren't out any money. I do consider World of Warcraft one of the best-made games of all time - there's a reason we at The Escapist voted it as our Game of the Decade. It's definitely worth a try, especially if you can get it for absolutely free.